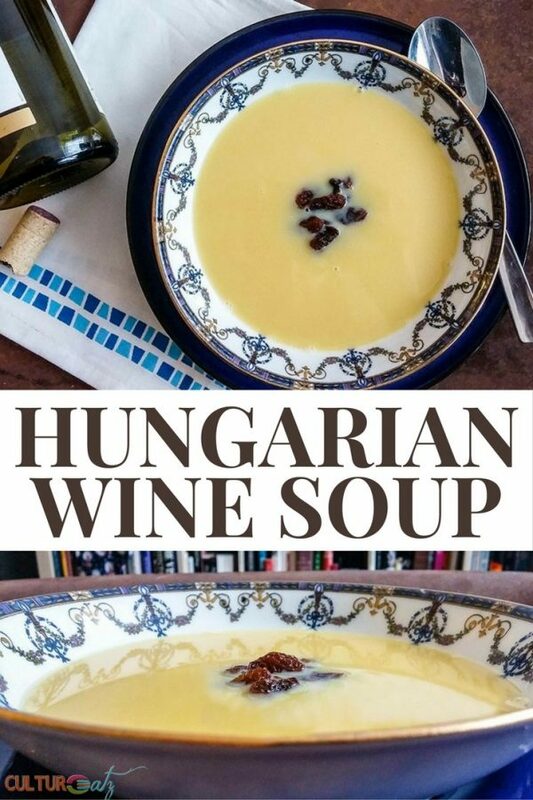 How much more festive can you get than this Hungarian Christmas Wine Soup. The flavor is tart and sweet, also very rich with the addition of egg yolks. Bookmark it now for next year! I know, a bit late for a Christmas recipe, but who cares you can make this festive Christmas wine soup year round. Hungary has a weird obsession with unusual soups. When I was there I had strawberry soup and elderflower soup. When I got back I made the classic sour cherry soup. While researching a recipe for ATW12P I came across a Christmas Wine Soup. The bulk of the soup is white wine. How could I not give this recipe a try! This post is my contribution to the Around the World in 12 Plates group. Each month the group explores a suggest country. For this month we are off to Hungary…a country I have visited in June 2016! The food is delicious there but very heavy. Let me show you what I mean with some food pics from that trip. Are you “Hung-ary” after seeing these pics? 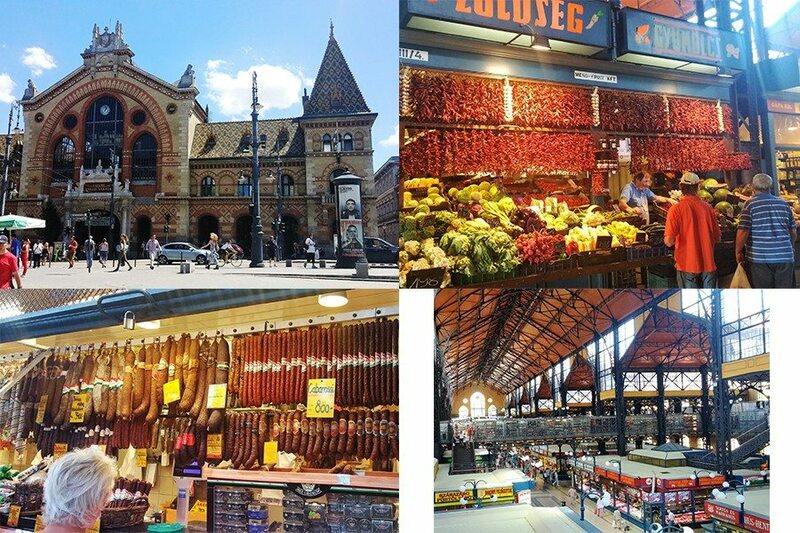 You can find so many farmer’s markets in Budapest but the biggest one is Nagyvásárcsarnok, or Great Market Hall, which opened in 1897. The ground floor is filled with locals choosing local produce, sausages galore and paprika in every form. All these food wonders are from the Pest side. Yes Buda and Pest are 2 cities. There is plenty of fine dining and amazing sites to explore in old town Buda as well. To a saucepan, add 3 cups of the wine, water, sugar, cloves, and cinnamon. Bring to a boil and lower heat to medium. In the mean time, beat well the egg yolks with the 1/2 cup of wine. Once the soup is boiling, add a ladle of the soup slowly to the egg mixture, beating constantly. Add another ladle in the same fashion. Beat the egg mixture into the saucepan, stirring constantly, until the soup thickens a bit (don't let the eggs curdle). Strain and serve immediately. 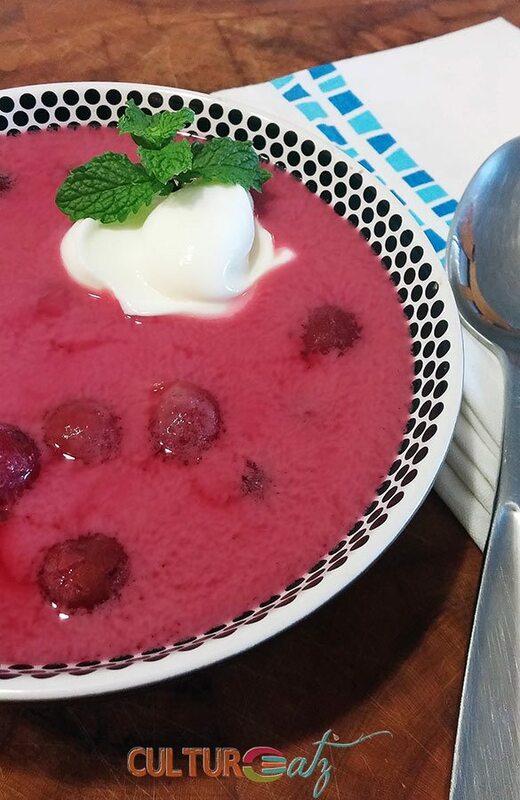 If you want to learn more about Budapest and see pictures of the city, head over to my post which also includes a recipe for the quintessential Hungarian summer soup: Cold Sour Cherry soup, or Hideg Meggyleves. I have 2 more posts from that trip as well, which includes the southern Austrian countryside, Vienna market and Buda, and more of Vienna and a cruise on the Danube. I have a Hungarian friend who says that this soup was usually made for Christmas Eve. Since Advent (including Christmas Eve) was considered a season of fasting by Catholics at that time, no meat was eaten and hence, this meatless soup of wine and eggs. What a hearty filling soup! I've been to Budapest many years ago and I still remember its beauty! Happy New Year my dear friend! Thank you and Happy New Year to you to Katerina. So happy you have wonderful memories of Budapest. Well this is new! I've never heard of wine soup. After looking at your lovely pictures and going through the ingredients list this definitely something I have to make. I had never heard of it before either. You'll be amazed at how creamy it is just with the yolks. Definitely unusual, but I'd happily eat a bowl! Hungary is on my bucket list---hope to get there one day! I like your adventurous spirit :-) I was a great city to visit, hope you do make it to Hungary! I love the cherry soup so I'd be interested in trying this. I'd love to visit Hungary one day too! This soup looks delicious! What I wouldn't' give to have a bowl of it right now in this extremely cold weather! 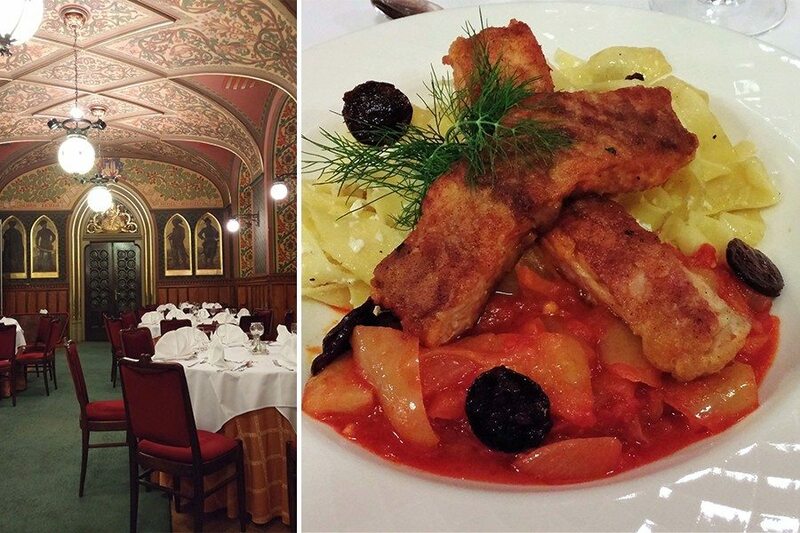 I loved the food that I ate on my visit to Hungary...so delicious...and inexpensive! Thank you Melody and yes it's like going to be -35 C with the wind ALL DAY today, omg! These are lovely pictures Eve. I hope I will travel there soon. Nice soup, looks delicious but I am afraid I will stick to my chicken noodles soup hehehehe. I so want to see Budapest! And this soup sounds amazing. I've not yet been to Budapest but would love to visit. dod you try the ChocoMe Chocolate? I profiled them recently on my site. It is delicious. when I read Wine Soup, I was interested. But when I read that it is primarily made of wine and eggs, I had second thoughts. I cannot imagine how this would be good, as I don't care for cloves either. Bit I do love Goulash, and would very happily opt for that. Happy New Year to you! 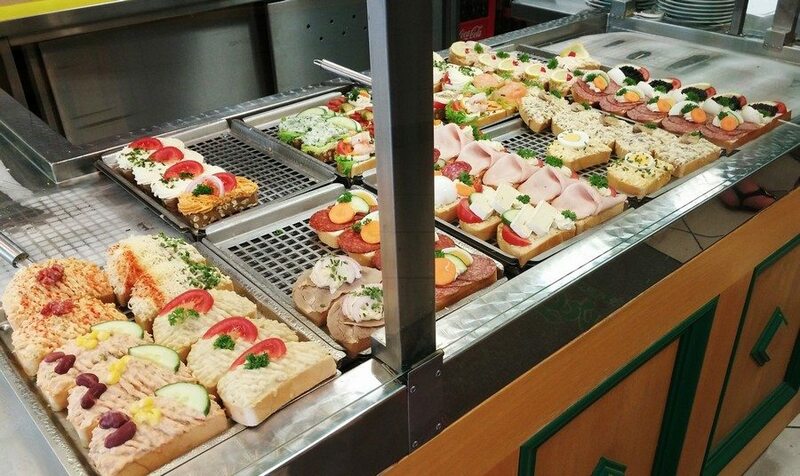 Those open-face sandwiches sure looked nummy! All the Hungarian food I've had is delicious. 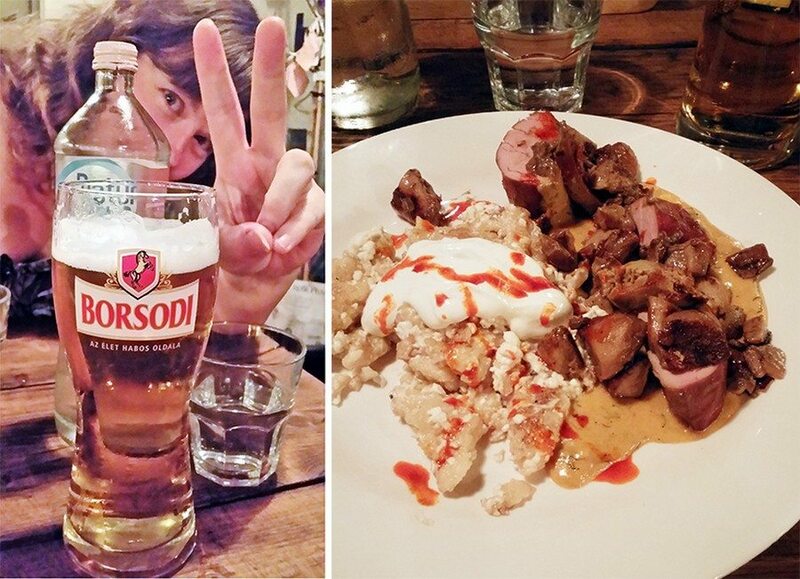 So cool you have had Hungarian food already! 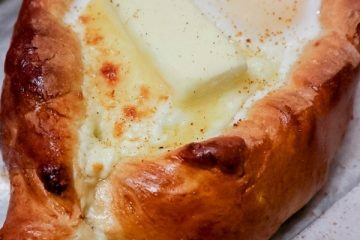 Definitely would love to have some more education on Hungarian food! This looks so vibrant and fresh! Thank you and it is a great cuisine to discover! Oh it really hits the spot Suze :-) So awesome you might go back this year! Interesting challenge, Evelyne! The soup sounds great and the sandwiches would be delicious! Thanks for sharing and Happy New Year! Fun group but just ended ... I have one in the works coming soon. Happy New Year Pam! This is so intriguing! Is this soup something you'd serve pre-dinner, or more as a dessert? Love seeing the pics from your trip to Hungary as well! Thanks, Korena and it is totally a pre-dinner, first service, kind of soup. As odd as it sounds lol. I hope to go back one day and explore more. It was nice to have you on the challenge, Evelyn, and to meet you at the last FBC! This soup looks really good and the flavors are so interesting! Winter is long, this soup is not only right for Christmas time ;-) . Happy New Year!! I'm not sure what to say about this. I've never heard of this before, and I'm surprised it doesn't contain onions and sour cream like most Hungarian recipes do, lol. Your creativity never ceases to amaze me. LOL OMG I was sure I was gonna get a reaction out of you with this post! No it is sweet, quite a bit of sugar, but tart with a dry wine. And the egg yolks make t so rich...who need sour cream. Cannot take credit, just goof internet research on Hungarian cuisine. What a unique soup! I will take a couple of sandwiches and the soup for my 2nd dinner :-) Happy New Year, Evelyne! Yes it is unique, and rich! Perfect with a sandwich. great to use up leftover wine bottles after the parties lol. Happy New Year, Angie! What an interesting challenge Evelyne. Is the group still accepting members? I think this would be a fun project for 2018.